I left the lopped-off thorny stems for you. I know it’s not your fault, construction crew. It wasn’t your idea, this demolishing. to the backyard; I may have killed it in the move. for regrading and storm drains. Whoo hoo! Let’s hear it for your very big machines! so I didn’t try to slow or stop anything. The rose that was still blooming has been moved. 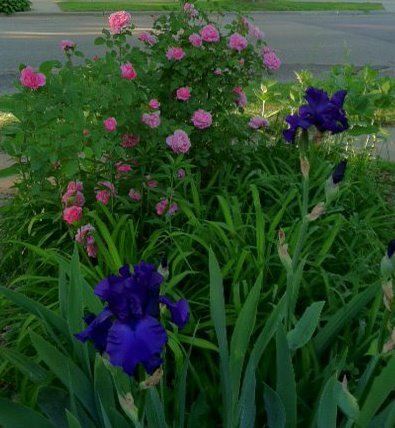 Roses and irises–all moved to the backyard. This entry was posted in Bloem or Pog, Poetry and tagged poetry. Bookmark the permalink.